from the Jovian moon of Europa. Ever since Tuesday night's debacle (which I missed due to work), I've been debating how the hell I should handle this opening section. Should I try to talk the masses off the ledge? Should I join the masses on the ledge? Should I try to rationalize Arsene Wenger's rotation? A. Molde, from Norway, and not a type of fungus. B. Sion, from Switzerland, not to be confused with Siam, which has been called Thailand since 1949. C. Borussia Dortmund, who we are guaranteed to have to play at some point. That's just how Europe works. D. Napoli, who we'll probably also have to play at some point. God, remember that Champions League group with us, them, and Dortmund? That was awful. They're actually tied at the top of Group D with Danish side Midtjylland, a club with far too many letters. F. Braga. Remember that time we lost to Braga in their stadium that's half inside of a quarry? G. Lazio, who are tied with Dnipro Dnipropetrovsk, which also has too many letters and why does it repeat Dnipro so many times? Are all of their players also named Dnipro? H. Lokotomiv Moscow. Do they all ride trains everywhere? Okay, that one wasn't funny. WHY ARE THERE SO MANY GROUPS? J. Tottenham Hotspur. God, some of these team names don't even sound real. K. SERIOUSLY, IT GOES UP TO K? Leading group K is Schalke. We've lost at home to them before. L. Partizan Belgrade. They've been in our European group before, too. Not to be confused with Marzipan Belgrade, which is delicious. So, who's ready for league leading Manchester United at the Emirates on Sunday? 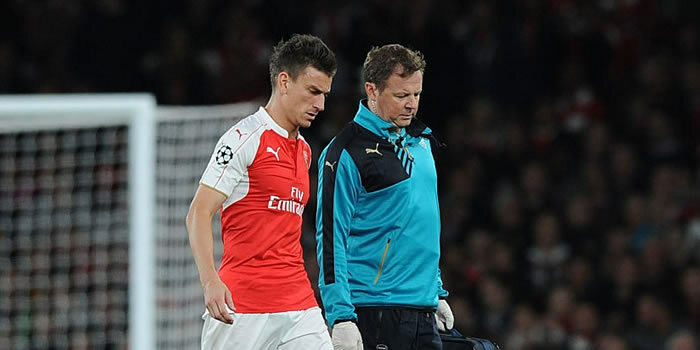 To add injury to insult, Laurent Koscielny left Tuesday's loss with a hamstring problem that has ruled him out for this match. Thankfully there's an international break around the corner, since hamstring problems usually take at least two weeks for recovery. In addition, since Gabriel's ban was altered from three matches to zero matches to one match (served last Saturday at Leicester,) the Brazilian will be available start alongside Per Mertesacker. Elsewhere, there are still doubts over the injured back-up holding midfielders, while the long-term injured remain long-term injured. Predicted XI: Cech, Bellerin, Gabriel, Mertesacker, Monreal, Coquelin, Cazorla, Ramsey, Alexis, Ozil, Walcott. the Emirates for Monaco. Everyone else did. The Red Devils are obviously without Luke Shaw after his devastating double leg break suffered against PSV. They will also be without Marcos Rojo, who has a hamstring injury. Michael Carrick missed the midweek match against Wolfsburg, but he has returned to training. Ander Herrera is also a doubt with a knock of his own. Tactically, this will be a match of two possession-based sides. Manchester United have the second-highest possession share in the league; only Arsenal has the ball more. David de Gea has returned to the starting XI after his prolonged transfer saga ended with him signing a long-term contract extension. The backline could be a little shakier for Louis van Gaal's side, with Shaw and Rojo both injured. Antonio Valencia started there in midweek but was removed at halftime. This likely means Daley Blind will slide out to left back with Phil Jones returning to partner Chris Smalling in the center of defense. Carrick's knock means United will likely start both Morgan Schneiderlin and Bastian Schweinsteiger in the holding roles. Juan Mata will start on the right with Memphis Depay on the left; both like to drift into the middle with possession, which Swansea exploited in their 2-1 win over United in August. Up top, Wayne Rooney will sit deep behind Anthony Martial, who is the new Super Pele, or something. Predicted XI: De Gea, Blind, Jones, Smalling, Darmian, Schneiderlin, Schweinsteiger, Depay, Mata, Rooney, Martial. I mentioned in my last preview that it took Arsenal until the end of October of last season to finally reach three straight victories across all competitions and... well... it looks like it'll be the same this time around! At best! Avid readers of the blog will remember that last week, I tried to come up with a term to describe how topsy-turvy Arsenal's season has been. As you'll recall, I didn't come up with one. Then, this week, everything got even more topsy-turvy. Big win on Saturday, embarrassing loss on Tuesday. MAKE UP YOUR MIND! Anyway, United have won four straight across all competitions since their Champions League matchday one loss to PSV Eindhoven. In Premier League play, they have won three straight since losing to Swansea; in the process, they've climbed to the top of the table, one point clear of their cross-city rival. Trafford last May that he did not get credit for scoring. It was a Tyler Blackett own goal. 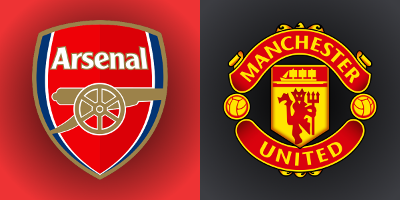 Arsenal won a big match against Manchester United in the FA Cup last year, but have not beaten the Red Devils in the league since May of 2011. Arsenal took one of a possible six league points from United last year, drawing 1-1 at Old Trafford in May after losing this corresponding fixture 2-1 in November. In that November match, Arsenal had over 61% of the possession and generated nine shots on target, but a Kieran Gibbs own goal in a massively unlucky sequence gave the visitors the lead against the run of play. Wojciech Szczesny was injured in that sequence, forcing Emiliano Martinez into his first Premier League appearance; United made it 2-0 from a counterattack in the 85th before Olivier Giroud, himself returning from injury, pulled one back in added time to make the scoreline more respectable. David de Gea, playing with a dislocated finger, made eight saves. 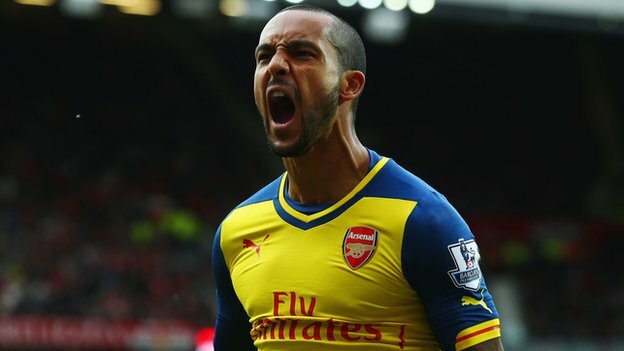 Prior to that loss, Arsenal and Manchester United had played out two straight draws in their fixture at the Emirates: 1-1 in April of 2013 and 0-0 in February of 2014, the former of which came after United had already won the league and the latter coming just days after Arsenal's lopsided defeat at Anfield. In 2006/07, Arsenal won both league meetings between the sides. Since that year, across all competitions, United have met Arsenal 21 times. Arsenal have won three of those matches, drawn five, and lost 13.
their last loss with him in charge. The referee is Cheshire-based Anthony Taylor. 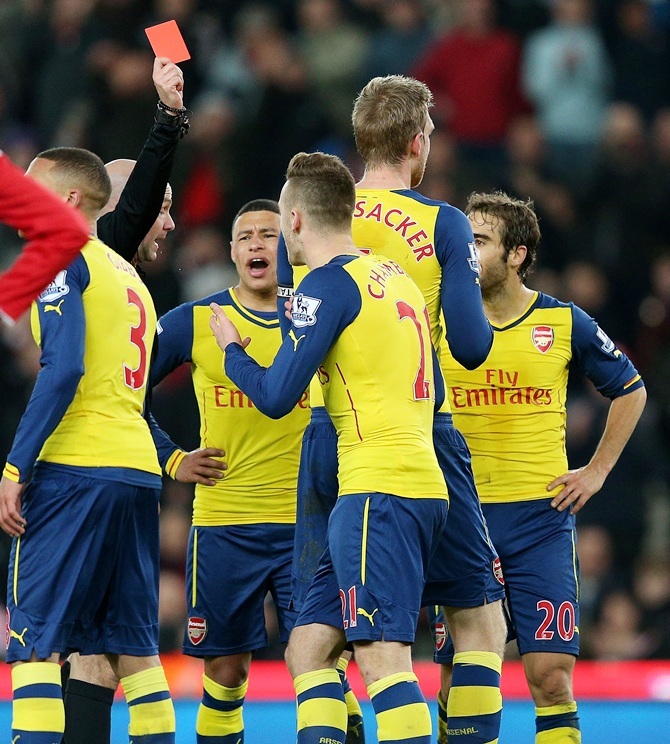 In 2015 (the calendar year), Arsenal are unbeaten with Taylor as the referee, winning three and drawing one. That includes a 5-0 win over Aston Villa, a 4-1 win over Liverpool, and the Community Shield win over Chelsea back in August. He also took charge of the 0-0 draw with Sunderland at the end of last season, but it's not exactly his fault Arsenal forgot how to score at home. Of course, everyone's memories of Taylor are clouded by the Arsenal matches he worked before that: the season opening debacle against Aston Villa in 2013 and the 3-2 loss at Stoke last year. Then again, the last time I tried to convince you Arsenal no longer had a bad record with a specific referee, it was Mike Dean, and we all know how that game went; that wound is still pretty fresh. As for Manchester United, they won twice and lost once with Taylor last season, beating Hull City and Newcastle while losing to West Bromwich Albion in May. This appointment is not without controversy. While he's currently based in Cheshire, Anthony Taylor was born in Wythenshawe, in Greater Manchester, and this is the first time in his career he'll be working a Manchester United match involving another title contender. So, you know, I guess you should get your conspiracy theory tin foil hats ready. John Painting is a contributing writer to the Modern Gooner and was eliminated from the Europa League in the first qualifying round. You can follow him on Twitter @zorrocat to commiserate.